Rodman developed a friendship with basketball superfan Kim during Rodman’s first visit to North Korea with the Harlem Globetrotters last February. It is believed Rodman is the first American to have met Kim, who leads a secretive life. Rodman considers Kim a “friend for life” and has called on President Barack Obama to make a phone call to Kim to discuss basketball. Since his initial visit, Rodman has returned to North Korea multiple times, most recently in December to train with the North Korean national team. The game is the latest news out of North Korea after the execution of Kim’s uncle Jang Sung-taek, who is believed to have been fed to hungry dogs for committing unspecified crimes against the party and nation. Jang was also a high ranking official in the regime of Kim’s father Kim Jong-il, and is believed to have helped Kim consolidate power after his father’s 2011 death. The U.S. State Department has long accused North Korea of human rights violations, including executions of political opponents like Jang and for its use of torture and prison camps with as many as 120,000 dissidents. 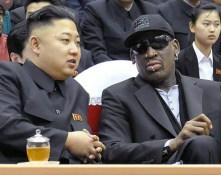 Critics attack Rodman for not speaking out against such atoricites. He counters that President Obama and former Secretary of State Hillary Clinton should talk with the regime about the abuses. Rodman does not consider that to be one of his goals for North Korea. Instead, Rodman’s two stated goals remain the creation of a North Korean basketball league and the improvement of relations between North Korea and the United States. Assuming Rodman remains in Kim’s good graces, the January 8 game could be a step toward both of his goals. Opening North Korea to American culture may lead to political openness, acceptance of difference, and an end to human rights abuses in the nation. Why did you say it is believed Jang was executed by being fed to hungry dogs? That sounds more like inflamatory, pejorative reactionary propaganda than William Saturn. At the time of the writing that was the believed method of execution. Come on, are you serious? Such a grusome act might even get the docile North Koreans to revolt. Previous executions were by standard machine gun firing squad. What made you think this execution would be different?